The D&L magazine for 1911s is one tough mother. The eight-round DLS magazine is a robust, reliable magazine that should stand up to a lifetime of use. The magazine is the weak link in every magazine-fed weapon. 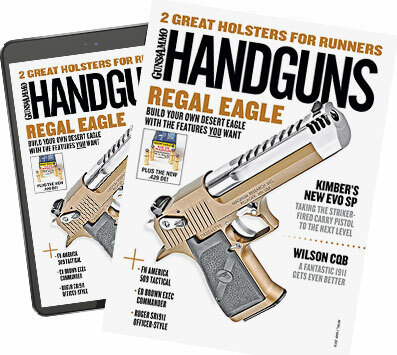 Whether you're packing the latest polymer wonder-nine or a custom 1911, it will not run reliably if the magazine that feeds it isn't up to snuff. As our longest-running and, arguably, most popular fighting gun, the 1911 has been the target of the most aftermarket magazine offerings. Many lesser examples of "improved" ammunition feeding devices for the 1911 I've tried weren't worth the cost of their packaging, while makers such as Bill Wilson, Ed Brown and Chip McCormick, to name a few, produce some truly outstanding 1911 magazines. The DLS magazine from D&L Sports is another worthy 1911 magazine. Dave Lauck of D&L Sports is known for custom AR-15s, 1911s and super-accurate, bolt-action sniper rifles. But no matter how much Dave over-built his 1911s to ensure they worked with unfailing reliability, he didn't have any control over the quality of the magazines he used. Usually, the aftermarket magazines he supplied worked just fine, but not always. And even the ones that did work had some serious shortcomings in Dave's critical eye. He finally got so frustrated that he decided to design his own 1911 magazine. One of Dave's chief complaints with his competitors' magazines centers around the fact that most use shorter followers and lighter springs to allow you to stuff eight rounds into a magazine body designed to hold seven. Lighter springs and shorter followers can adversely affect reliability. Cramming eight rounds into the standard-length magazine body also eliminates the extra compression space necessary for you to seat a fully loaded magazine with the slide closed. Dave acknowledged that an extra round was a handy thing to have in a single-stack pistol. To get it, he torture tested several eight-round magazines to find one capable of meeting his demanding standards. ACT's steel magazine bodies were the only ones to pass muster, but he was not satisfied with their followers, base pads or magazine springs. Dave designed a machined aluminum follower for his new 1911 magazine. To eliminate tilt and assure that it retains the correct feeding angle from the first round to the last, the follower has two long legs. Dave used a convex follower to ensure reliable feeding of the last round in the magazine. An aluminum shelf positively engages the slide stop after the last round is fired. The DLS magazine uses a top-quality, extra-power magazine spring. It also employs an aluminum base pad of Dave's design. The base pad extends approximately a half-inch from the bottom of the magazine. It is a hollow piece, which allows the spring more compression room so you can seat it in your favorite pistol, even when your slide is closed and the magazine is stuffed to capacity. The hollow design also makes the use of that reliability-enhancing, long-legged follower and extra-power springs possible. D&L offers several options, including a low-profile aluminum pad that reduces magazine capacity to seven rounds for shooters who require a more concealable magazine. Magazines come in matte black, nickel or matte hard chrome. DLS upgrade kits are available for shooters looking to upgrade their current ACT magazines. I'd heard good things about the DLS magazine, so I ordered two of the $59, eight-round matte black magazines for testing. I used the magazines with a varying brands and styles of bullets from 185 to 230 grains. I tested them in full-size 1911s from Nighthawk Custom, Wilson Combat, Kimber and Springfield Armory for a total of 800 rounds. Though the DLS mags are easy to disassemble for cleaning, I chose not to clean them because few shooters I know do. The DLS magazines I tried performed flawlessly throughout my testing. They were easy to seat when fully loaded, they locked the slide back on all four pistols every time, and they fed without so much as a hiccup. In short, they did everything a magazine is supposed to do.